Embrace your love of travel, adventure and whiskey with these stunning, mouth blown, lead-free glass decanters. Your guests will admire the artfully detailed antique plane encased in the etched globe decanter. Each decanter is beautifully displayed on a Mahogany stained wood stand with a cork stopper. Holds 35oz. of your favorite whiskey. Is the glass really etched or is the globe design applied by other means, paint/decal? BEST ANSWER: Etched. Really a nice decanter for a special libation. Does anyone know if/where I can buy a replacement stand for this piece?? BEST ANSWER: My order was delivered with a damaged stand and the company promptly sent a replacement. That replacement piece broke at the stem and I glued it with gorilla glue. NO sorry I don't. That is a good question would like to know also in case I might need one in the future. How much whiskey does it actually hold? BEST ANSWER: This was a gift for a friend so i am not sure of the exact contents of the decanter, but I believe he said it holds a fifth of whiskey. What are the dimensions of the circular portion of the base/stand? I gave this decanter as a present to my grandfather. He absolutely loved it. It is a unique decanter that I have never seen before. Great product! 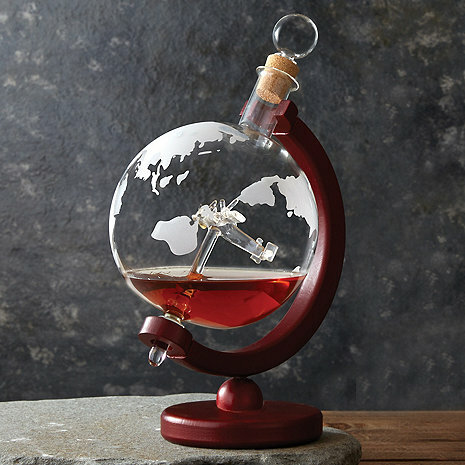 The decanter will be a gift to my son-in-law who loves flying and will make a nice addition to his bar. Beautiful piece of art and it came right in time for Christmas!! Absolutely stunning piece. I could not get over the quality and detail of the plane whiskey decantur when it arrived. It was everything I wanted it to be! Perfect size for a whiskey decanter & my boyfriend loves it! It was an attractive item but it was weightless which made it seem kind of cheap. Other than that it was a nice item.